The “book was better” statement in particular warrants some attention. When I hear this, I ask myself, “Is the book really better, or is that person just trying to say something politically correct?” Yes, political correctness extends beyond our attitudes toward controversial issues and our diction when referring to people of different nationalities, races, or religions. It even extends to the conventions of informal film discussion. To be politically correct, a moviegoer has to follow certain rules. The most common PC rule is that Hollywood produces drek while independent cinema is invariably marvelous. Yet the line between Hollywood and indie cinema is blurred today. Miramax is now owned by Disney and one-time indie gods Robert Rodriguez and Kevin Smith bring us computer-generated Hollywood products like Spy Kids and Jay and Silent Bob Strike Back. So now more than ever, people are falling back on the old, reliable “book was better” comment to make themselves sound like sophisticated viewers. Granted, sometimes the book really is better. But the reverse can be true as well. Screenwriter Buck Henry, for example, made the influential and respected The Graduate and To Die For out of books that otherwise would have been long forgotten. William Goldman is another example of a screenwriter who can spin movie gold out of the straw of lesser novels, whether adapting one of his own books (The Princess Bride, which is infinitely better at balancing satire and sincerity in movie form) or the novels of other authors (such as Stephen King’s Misery). All of these films share one thing in common: they are not so much based on the details of the original stories as they are inspired by the spirit in which those stories were written. In making a movie, a filmmaker’s priorities should be art and entertainment rather than word-for-word transliteration. As Roger Ebert argues, fidelity should be a high priority with marriage, not with movies. 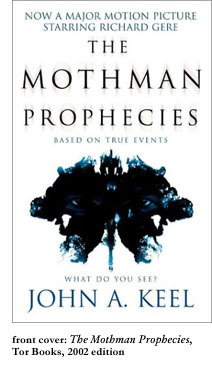 One could learn a lot from The Mothman Prophecies, a movie based on the book of the same name by John A. Keel. In the movie, Richard Gere stars as John Klein, a reporter who, while driving one night, gets lost and finds himself 400 miles off course in the span of a couple of hours. His car breaks down at an inconvenient time, and Klein walks up to a random house and asks for help. The inhabitants are furious, claiming that Klein, who has never seen these people before, has been harassing them for the past few nights. Klein investigates, but instead of finding answers, he finds the mystery becoming more labyrinthine; people in town have been terrorized by visits from a mysterious creature nicknamed the Mothman. The mystery becomes deeply personal for Klein when he learns that his wife had visions of the Mothman shortly before she died. I am no auteurist, but I posit that of all cinematic genres, horror is most definitely a director’s medium. Atmospheric direction in a horror film can cause viewers to overlook cheesy acting and weaknesses in the story’s logic. Mark Pellington, the director of The Mothman Prophecies, knows this and goes all-out, pulling all the stops to create such a level of unease that even the eyes of Debra Messing, that familiar face from Will and Grace, become nightmarishly creepy. The Mothman Prophecies, like so many other adaptations, sports some key differences between book and film versions. Character, setting, and structure are all altered for the sake of translation from one form of entertainment to another. In each case, the alteration is a vast improvement over the book. In terms of character, the key difference is the protagonist, who in the book is the author himself, a parapsychologist and UFO analyst. Keel is someone whose life revolves around looking for paranormal activity, so it is little wonder that he finds unexplained phenomena and points to it as proof of the extraterrestrial or supernatural. Imagine meeting this guy at monthly cocktail partieshe’s always talking about Bigfoot, demons, ghosts, and UFOs, so when he starts talking about the Mothman, who may be some weird amalgam of two or more of the above, no one would blame you for dismissing the subject with a roll of your eyes. The book has an identical effect. Keel comes across as a fanatic, a man who has spent so much of his life obsessing over the paranormal that his life has become consumed by it. John Klein, on the other hand, the protagonist in the film, has never given much thought to the supernatural. Like Keel, Klein is a writer, but Klein has nothing to do with UFOs and the like. A political commentator of some repute, Klein earns his living by analyzing some very mundane aspects of the real world. He is a man who has both feet on the ground, which makes his plunge into the bizarre aspects of the Mothman prophecies all the more eerie. The implication is that if such events can happen to a man like Klein, they could happen to anybody. The unintended implication of the book, on the other hand, is that if such events can happen to a man like Keel, he’s obviously a nut. The events depicted in the book, which was first published in 1975, allegedly happened in 1966, but the movie wisely updates the story to the present, making the possibility of the Mothman more immediate. Thirty-six years is a long time. Such a significant time gap would defuse any potential anxiety that the Mothman might be out there somewhere. But since the movie is set in the presentand it’s “based on true events” as wellthen the possibility of the Mothman seems like a very real threat. The sheriff has no patience for disjointed continuity, and her frustration mirrors the feeling one gets from reading The Mothman Prophecies. Does the book have its merits? I suppose so. But the movie was better.